Our son had eye surgery last summer. It seemed like nothing to worry about. I mean, he’s had 12 brain surgeries, so what’s an eye surgery? No, I’m not going to a bad story here. It was actually a GREAT thing. I just didn’t know it at the time. I of course expected it would help him. But I was unprepared for just how much. For a kid who could have been taken off life support, (they asked if we wanted to do that after he had a stroke), he has become a pretty remarkable little guy. Despite not being able to predict his outcome, we elected not to remove life support, and it seems that each and every thing he does is incredible to us. Perhaps because we had no expectations after that initial blow. The afternoon after his eye surgery, he commented that he was seeing ‘two daddies’. Our hearts sank as we started to panic, thinking that maybe he had double vision and would need further surgical intervention. We swallowed hard and went to the follow up appointment the next day. The doctor practically did a happy dance while explaining that this meant both eyes were working together with the brain for his vision. Say what? I had butterflies in my stomach. Of all the things this child has been through, this is the one thing that has been able to be somewhat corrected. I could hardly breathe I was so excited. Since then, our son has made great strides, literally, in his walking, standing, and fine motor skills. Given that Cerebral Palsy does not worsen, anything he can learn and do early gives him that much more of a chance to succeed physically. But what it’s truly done is give him, well, attitude. Confident, I can do it myself, attitude. Last week as we placed him in his height chair, he insisted he could buckle the straps. It took over six minutes, but we bit our collective lips and let everyone’s stomach growl and let him do it. Today he is down to less than two minutes, and after the first ‘click’, he asks, “Should we do the next one?” I ask him if he wants help and the answer is always, “I do it!” While I want to help him, I know in my heart that both allowing him and making him do it himself is the right thing. I’ll bite a hole in my lip if I have to, to get him the confidence and independence necessary for life. His siblings wait anxiously with us as we watch him struggle each morning. Their clapping and ‘hurrays’ for him put a glow on everyone’s face. A great way to start the day for us, a great way to start life for him. My husband calls himself a geek. I guess that makes me Mrs. Geek. He is a computer programmer, and I am a self taught computer and gadget junkie. Together we ride the wave of electronics, internet and social media samplings, each more enticing than the next. In our spare time we instant message each other from across the room. On date night we go to the book store. With our computers. Romantic, no? He gets up to browse the programming section while I, glued to Facebook or a blog writing project, cozy up to my wireless mouse. We understand each other. Why then, were we shocked to see our toddlers, all three of them, figuring out how to access YouTube, Angry Birds, Pandora and more – on the phone, the iPad and the computer. At first we were so proud. “Look at that!” we exclaimed, as our two year old easily navigated the on/off button of the iPad. “Ohhh, how cute is she!” we remarked, as our other two year old found her way into YouTube and shrieked with excitement at a ladybug video. It seemed harmless. We were amazed and choked up when our third two year old, who has Cerebral Palsy and motor development issues, was confidently able to navigate through several layers of an educational flash card program. 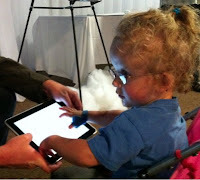 We were overjoyed at his physical ability, and immediately proclaimed the iPad as a turning point for therapeutic use. My husband got to work writing applications to support our son’s needs and we were very excited. Then we came back to Earth and realized, if a child who had a major stroke and has motor delays and perhaps other delays can so easily access this and other devices, what dangers lie in wait? It’s thrilling to see that our children can so easily learn how to use things that will, we believe, enhance their learning and life experiences. The untapped potential is overwhelming to think about. But so are the commensurate dangers that lurk. Our 14 year old is joined at the fingertips to his phone and friends. We require his public use of the phone and computer, and routinely ask him specific questions about with whom and what he discusses. He knows we can and will step in at any time. We didn’t have cell phones or computers when we were 14. Kindergartners now have computer lessons. What will the digital age be like when our toddlers are in high school? As with any other parenting approach, we believe that being too harsh can backfire, but being too soft is and saying ‘do as I say and not as I do’, is not an effective strategy. So as easily as we allow them to learn and explore, we also monitor and guide their access. Kids model what they see. If they see us on the computer a lot, they need to also see us behaving appropriately. Our teenager is on the hunt for life. More curiosity will follow with the little ones. Despite encryption and other ‘safeguards’, the digital world has a great deal of uncertainty with how information is handled and will be handled in the future. Learning how to manage this at home FIRST is the most powerful tool a child can have in their arsenal as they enter any world beyond their front door. Originally posted on the Yahoo! Motherboard/Shine! I have never been a fan of cherries. Maraschino, sweet, sour, pie, or any other kind, never held any appeal. So when a friend asked if I wanted a tart cherry margarita, I hesitated. Then she told me that cherries have anti-inflammatory properties. What?? I can have a tasty libation that is healthy? This required more research. I watched her pour measured amounts of tequila and, ok, I don’t actually know how to make a margarita, so I don’t know what she poured. But as I watched, I became more curious. Would I like the taste? Would I feel relaxed? Well, probably relaxed, but that would be the tequila speaking. It turned out to be a lovely beverage, though it looked murky and foreboding. For someone who doesn’t drink much, I was pleasantly surprised that I experienced no aftereffects the next day. As a lifelong athlete, I am no stranger to inflamed knees, hips, etc. So my research extended beyond the rim of the glass and I discovered that they are quite beneficial to your health. In 2008 surveys conducted by IRI Data and The Hartman Group, cherries were identified on a trend as a homegrown ‘super fruit’. The studies claimed that tart cherries in a variety of forms have among the highest levels of disease-fighting antioxidants, when compared to other fruits, and 19 times more beta carotene than blueberries or strawberries. Consuming just a few tart cherries daily can make a difference. Can you imagine not having to take aspirin or pain relievers any longer? Seems pretty easy! I’m off to go look up how to make a margarita.